What would it be like to have one of the world’s foremost exegetical theologians sit at our side as we study the Scriptures while being assigned the sole task of explaining to us all the hermeneutical mistakes we most frequently commit at each step of the way? Such would probably make most of us nervous as it is unlikely we would walk away unscathed. Yet the tremendous profit that could be gleaned from such an encounter is inestimable. Exegetical Fallacies seeks to draw us in into just such an experience. D.A. Carson is a distinguished New Testament scholar whose publications have earned him no small recognition in the evangelical world, not the least of which include significant exegetical commentaries on Matthew (Expositor’s Bible Commentary) and John (Pillar New Testament Commentary), a New Testament Introduction, and a host of other literary works. Given his high level of experience in handling Scripture with scientific precision coupled with a tenacious commitment to the inerrancy of Scripture and historic Reformed orthodoxy, scarcely a more qualified or trustworthy individual could have written a book exposing much of popular, yet incorrect, biblical interpretation. 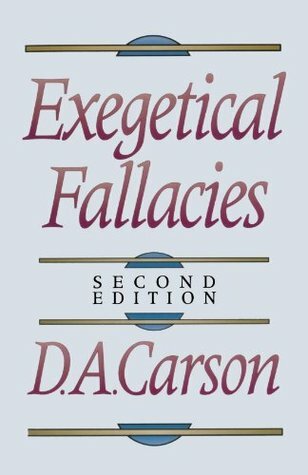 Carson describes the book as “an amateur’s collection of exegetical fallacies” (25). Though his method is intentionally negative as he hones in on exposing error, his goal is not to provoke the cynicism of scholarly one-upmanship and intellectual pride, but positive, constructive self-criticism on the part of the exegete, in order that “we may all desire more deeply to interpret the Word of God aright” (15) and engage in a safer, sounder, and more healthy exegetical method. In 148 pages of concisely condensed content, Carson seeks to help his readers avoid the majority of interpretative errors most frequently committed in applied hermeneutics (quite an ambition, indeed!). Significantly, however, the brevity of the book doesn’t detract from its comprehensiveness. Its systematic categorization of what Carson perceives to be the most common hermeneutical errors committed by scholars and layman alike ensures a breadth of scope that make this book akin to a practical handbook on exegesis. Its contents are sufficiently rich and meaty that one cursory reading is insufficient to archive its contents into one’s mental reservoirs. Yet the brevity of the work facilitates its usefulness among a wide readership while its scope and detail ensure its practicality for even the experienced theologian. The content is neatly organized into four categories. The first consists of an insightful catalog of “Word Study Fallacies” (Chapter 1) which begins with “the root fallacy”. This is described as “one of the most enduring of errors” (28) and includes eisegeting meaning into words based on the etymology of their component parts. Another one is “semantic anachronism” which “occurs when a late use of a word is read back into earlier literature” (33). Yet another is the “appeal to unknown or unlikely meanings” (37) such as that done by gender-role egalitarian scholars with the word κεφαλή (apparently motivated to support their loaded theological agenda). One of my favorites is, “unwarranted adoption of an expanded semantic field” (60), which consists of ignoring the specificity of a word’s meaning in its particular context and importing into it meaning derived from its broader semantic range (an error I’ve seen sincere believers commit rather frequently; especially those whose favorite word-study tool is the back of their Strong’s Concordance!). Carson wittily sums up the gist of the circumspect caution necessitated as the student of Scripture engages in the linguistic study of words when he quotes Nathan Söderblom: “Philology is the eye of the needle through which every theological camel must enter the heaven of theology” (27). Many a Bible student, somewhat oblivious to the technicalities of linguistics, only knows a sufficient amount of Greek to be dangerous, as he totes off his knowledge but lacks sufficient acquaintance with the language so as to accurately discern what its words are communicating in any given context. In addition to learning more Greek, many of these word study fallacies can be avoided by a sober recognition of the limitations of popular linguistic tools, a more thorough immersion in the Greek text of the New Testament as a whole, and a painstaking study of the literary, historic, and cultural context of each word under question. The next collection of errors is “Grammatical Fallacies” (Chapter 2), which lists those connected with various tenses and moods and those associated with syntactical relationships. The former group lists errors related to, for example, the potential “snapshot” connotation of the aorist tense of Greek verbs such as is frequently appealed to in many a Bible commentary, and those committed by attributing reflexive (i.e. self-acting) meaning to verbs in the middle voice, to name but two. The latter group covers conditionals, the article, and relationships between tenses in different clauses. The third class is categorized as “Logical Fallacies” (Chapter 3), understanding “logic” as that which is universally true and intrinsic to the nature of all coherent knowledge and rational communication (89). Among these are an “improper appeal to the law of the excluded middle” (90), “appeal to selective evidence” (93), “improperly handled syllogisms” (94), “purely emotive appeals” (106), and “simplistic appeal to authority” (122), among others. This reader found this section to be particularly insightful as this category of errors is probably the most responsible for the propagation of false doctrine and damnable heresy in the modern church. Scholars and everyday Christians alike are susceptible to deficiencies in the application of logic, many of which can be avoided by a healthy dose of sanctified common sense. The final category of fallacies is labeled as “Presuppositional and Historical Fallacies” (Chapter 4). This section begins with a discussion of the “New Hermeneutic”, which consists of a modern (or rather, post-modern) approach to epistemology that, applied to biblical interpretation, results in undermining the simplicity of the text of Scripture by claiming that one’s own cultural, linguistic and ethical baggage so obfuscates the real meaning of the text that the interpreter is incapable of arriving at a precise understanding of its true authorial intent. Thus the door is opened to relativism while the foundation for all objective truth is grievously undermined. Carson next identifies some historic fallacies such as the “uncontrolled historical reconstruction” that is definitively characteristic of so much of liberal scholarship. As conjectures are made as to what was allegedly the “real” historical context of a given biblical document, such hypotheses are often used to subvert the inerrancy of Scripture as they are contradictory to the straightforward assertions of Scripture itself! Finally, Carson’s “Concluding Reflections” (Chapter 5) bring up a host of other issues that he merely mentions in passing, hoping to inspire more determined consideration from his readers. He ends by concluding that there are many difficult issues and speaks of the need for humility in approaching the Bible, a resolve to focus on central truths of Scripture rather than peripheral speculations, and a determination to study hard in order to build up our exegetical skills. There is much wisdom in his words, and we would all do well to heed his plea for prudence, care, and discretion in biblical interpretation. The plethora of examples provided is a positive strength of the book. Carson doesn’t merely brainstorm a list of fallacies; he provides footnoted examples from published works to illustrate each one. The fallacies enumerated are derived from a diverse spectrum of traditions and theological persuasions. Though they come mostly from the scholarly world, many are not foreign to the preacher who is searching for insights to include in his next sermon by leafing through the limited tools at his disposal. By providing such a wide array of examples, Carson greatly enhances the practicality of the book. It is particularly helpful as it sets the book in the context of real-life struggles to properly exegete the Word of God. Yet with such a broad scope of fallacies provided, it is unlikely anyone could read this book without having to confess at least one exegetical sin of which he has been guilty in times past! Carson himself doesn’t even emerge unscathed: “Two of my own exegetical errors receive dishonorable burial” (!). By reading this book, every preacher will soon recognize errors that he himself has committed, and be sharpened in discernment that he may avoid such errors in the future. In fact, it is difficult to read it without walking away with a sense of being overwhelmed by one’s personal inadequacy. I say this as a complement to the effectiveness of the book. If there is one thing that needs to be forever outlawed in biblical interpretation in the church, it is the flippant, nonchalant attitude of handling Holy Scripture as if our interpretations were of no eternal consequence (cf. Jam. 3:1). Carson reminds us of what a grave error it is to interpret Scripture according to the whims of our own notions and speculations, and of the utter necessity of submitting ourselves to the authority of Scripture in the exegetical process as we humble ourselves to the data of the text and employ all diligence to process it correctly so as to arrive at sound, biblically-warranted conclusions which are honoring to God and Scripture. The long list of fallacies (over 40 in all!) is akin to the prohibitions of God’s law: it sets forth a standard that is ideal, and therefore, largely unattainable in perfection. Yet it informs us of what is correct, exposes our error, and drives us to strive with all diligence to avoid transgressing as we rely on God’s help and trust in His mercy. It also has in it analogous inherent limitations. Just as the law exposes moral error but is incapable of imparting to us the righteousness it demands, this book exposes exegetical error and is not intended to provide the positive training in hermeneutics we need to conduct ourselves uprightly in this task. For that, we need to turn elsewhere, namely, to a prayerful dependence on the gracious illumination of the Holy Spirit, to the continual reading and meditation of Scripture, to the acquiring of as much biblical knowledge as providence allows, and to the balanced, diligent use of the study tools which help us to bridge the gaps of distance that lie between us and the biblical world of old. Every preacher and teacher in Christ’s church would do well to acquaint themselves with the contents of this book. Though it is arguably lacking in pastoral sensitivity, so much so that it could potentially discourage the average layman who has no knowledge of its technicalities, and could leave us wishing that Carson had said more concerning the doctrine of the simplicity of Scripture by way of encouragement, it is an indispensable resource for every Bible expositor’s tool belt of knowledge. Even a cursory acquaintance with the catalog of fallacies registered herein can save us all from a multitude of mistakes. And, as Carson notes, it could go a long way toward humbling the innate pride in us all, that we may be less confident of ourselves and more careful in rightly handling the word of truth as we look to God for grace.